HomeFAQWhat about the Global Mean Sea Level (MSL) Indicator?What product should I use to compute the Global Mean Sea Level indicator? 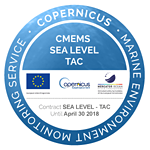 Ocean Monitoring Indicators (OMIs) are quality checked and consistent information allowing regular monitoring of the ocean state, variability and change. Such OMIs are distributed by CNES/AVISO and also by the CMEMS (see DUACS products webpage). Among the different indicators, the Global Mean Sea Level is a key indicator of climate change and can be computed from the DUACS products. The stability of the altimeter GMSL is ensured by the TOPEX-Poseidon and the Jasons reference missions. The associated measurements are restricted to +/-66° latitude. The other complementary and opportunity missions contribute to improve the sampling of mesoscale processes, provide the high-latitude coverage and increase the product accuracy. The AVISO (GMSL) is computed by 10-day box-averaging of the calibrated and validated L2P along-track measurements from the reference missions only. The use of the Geophysical Data Records (GDRs) leads to a relatively short delay of 3 months compared with the present time. The GMSL can also be computed from the L4 delayed-time (DT) multi-mission gridded DUACS sea level products distributed by CMEMS and C3S. The DT products are regularly reprocessed (~3-4 years) and the time series is regularly extended (about 3 times per year) with a timeliness of about 5 months due to the timeliness of the input data, the centered processing temporal window and the validation process. Details on the altimeter and processing algorithms are available in Pujol et al., 2016 and Taburet et al., 2018. 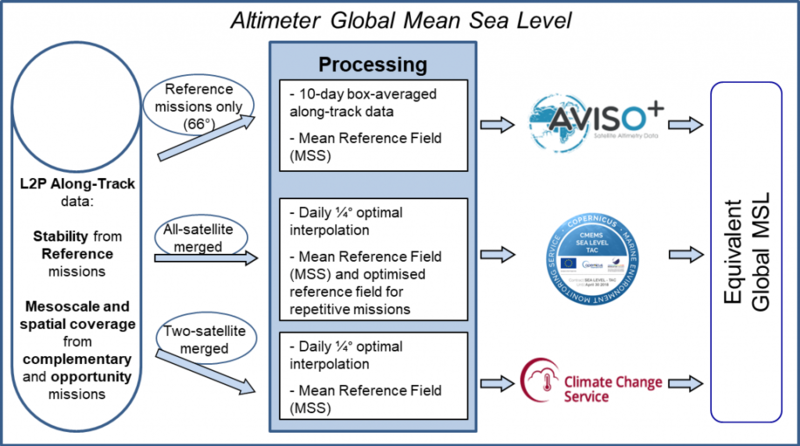 The altimeter DUACS products allow the computation of different global Mean Sea Level records whose scientific content are equivalent. The AVISO ‘reference’ GMSL and the ones derived from the CMEMS and C3S gridded products (considering the same version and period) are considered to be identical since almost the same altimeter standards are used to compute the sea level anomalies and for all products, the long-term stability is ensured by the same reference missions. The remaining observed GMSL differences are not significant given the uncertainty considered on different scales (Ablain et al., 2015). Note that the situation is not the same on a regional scale where differences can be found according to the product used for the MSL computation. Table: Main characteristics of the Global Mean Sea Level records derived from different altimeter products. The DUACS altimeter sea level products used to compute the GMSL are not corrected for the TOPEX-A instrumental drift observed between 1993 and 1998. The altimeter mean sea level trends derived from the DUACS products are not corrected for the effect of the post glacial rebound and the users are invited to use their preferred Glacial Isostatic Adjustment (GIA) model.